Alice Jones is a timid orphan who lives with her uncle, aunt, and cousin Karen. Karen is much more confident and outgoing than her cousin, and overshadows Alice at everything. Some people have faith in the shy girl – for instance one of her teachers at school says that if she had confidence in herself she could do so much better, because she is very clever at most subjects. Her family are pretty dismissive of her, in ways bordering on abuse – the two girls share a birthday, but while Karen is bought a pretty party dress and made much of, Alice is simply bought a pair of socks as a present and told to be grateful that they have looked after her for all those years. We don’t see much of this miserable home life, though. The initial four page episode sees both Karen and Alice apply for a school exchange holiday in Texas – exciting! – which they are both chosen for (much to her family’s disgust), and the small group of seven schoolgirls sets out in an equally small twin-prop plane. The plane is too small to survive a huge storm that blows up, and it goes way off course – instead of heading to Texas, the girls find they are flying over South America! The final straw is when the pilot’s eyes are dazzled by the shining golden roofs of a mysterious lost city, which the stewardess only has time to exclaim must be “El Dorado, the lost golden city of the Incans!” before the plane crashes. The two grown-ups are killed and the seven schoolgirls are left alone in an exotic jungle. Alice wants them to head towards the golden city, but Karen, who has appointed herself the natural leader of the group, calls the idea absurd – because Alice was the only one of the schoolgirls to see the golden roofs. Karen takes charge and leads the girls onwards – luckily in the direction that Alice thinks they should be going in anyway (they’re following the path that the plane made as it crash-landed). In the forest a bird appears – again, Alice is the one that sees it first, but Karen notices that its beak and claws have been painted gold, and that it is a tame bird. It leads them all to the lost city after all! Karen is furious at being proved wrong and drags Alice along with her to the temple that the bird is leading them to. In the middle of the temple is the image of the sun, and it starts to glow mysteriously, as the two girls are surrounded by robed priestesses who hail them as ‘great ones’ and bow down to worship them! The priestesses hail the two girls as part of a prophecy of a ‘white-skinned goddess to lead us back to greatness’, and seem to be treating all the group to luxurious accommodation. Alice is the only one who is suspicious – she believes they are being imprisoned under the guise of having servants waiting on them hand and foot. And something she overhears the head priestess talking about gives her a fright – the priestesses need to decide which out of Alice and Karen is the Sun Goddess and so they will be put to a test. Of course Alice wouldn’t usually stand in Karen’s way for such acclaim, but she does so in order to protect a slave girl, Chana, who is threatened with death simply for daring to look upon the group of schoolgirls. In return for Alice’s support, Chana gives her some clues to help pass the test. Just as well The two girls are made to navigate a gigantic maze and to get past the guardian at the centre of it – a sleek black jaguar. Following the instructions to ‘go above the maze’ and to ‘call the black one by his name’, Alice succeeds: she climbs the walls (despite her great fear of heights) and soothes the jaguar by calling him Aquila as instructed. At the last minute however, she hears the echoing voice of Chana, calling to her: “Help me Sun Goddess, or I will die!” The treacherous high priestess has gone against her word and banished Chana from the city, which will mean death in short order if she is not allowed to return. But a nasty surprise meets Alice on her return to the centre of the temple: the urn that she had already reached, and which she needed to take to the high priestess to prove her claim, is gone! Of course Karen had taken it despite knowing that Alice was there first – and Alice is now branded the “false goddess”. The only thing that is keeping Alice going is the thought of letting Chana down – Chana being the only person so far who has believed in Alice and not seen her as “some kind of bundling idiot”. Alice is also justifiably worried about the whole dangerous situation that they are in – a danger that none of the other girls realise. Not that she understands all the dangers – another slave girl tells her that if she wants to walk out of the temple into the city and nearer to Chana, all she has to do is to walk past the guards. Which she does – but it’s the act of entering the palace that the guards are there to prevent. Alice is left wandering in a deserted city which seems not to have been lived in for hundreds of years. Where is Chana and what is the fearful secret of this mysterious land? Here is where Karen once again shows herself as being much less astute than her cousin (as well as much less kind and considerate, of course). Why on earth would the high priestess make it a condition that all new joiners to the city must drink the water from this specific spring, if not for some nefarious reason? It’s not done as part of some big joining ceremony, it’s just Alice, Karen, and the high priestess. Karen even impatiently says she will drink some of the water to prove it’s not poisoned, but Alice can’t accept that risk, and dashes the cup over the posh robes that her cousin is wearing, so that Karen leaves in a huff. That suits the high priestess all right, who knows jolly well who’s figured out what: “You, little one, are too clever. You have found out too many of my secrets!” And under the threat of death, Alice drinks – and finds that, as promised, her previous life becomes like a dream. She works in the kitchen alongside other slaves, agog to even catch a glimpse of the fabled Sun Goddess and her servants. The sight of the magnificent goddess playing catch in the sun seems to ring a bell but the memory fades as soon as it has come – the reality of life is her work in the kitchen and the threat of recurrent earthquakes that the city suffers from. A fellow slave informs Alice that the Sun Goddess is to be sacrificed to save the city from the anger of the god that makes the earth shake – and even this does not rouse Alice from her dreamlike state. After all, a goddess cannot really die, just appear to do so – really she will just be returning to the sun. Nice explanation! Even in this dire situation, Alice is not entirely without friends. No, not the group of school girls that she came with – the rotten lot are following Karen’s lead and ignoring her entirely, happy for her to end up as a mere slave. But one of Chana’s friends advises her that she must try to avoid drinking the water from the spring of life, and then she will remember who she is and what she is trying to do. And so she does – but only at a point when she is trapped below the kitchens and outside a locked door, menaced by the rising waters of an underground lake! That’s the point at which the episode in the sample above comes in. She is rescued, almost unbelievably, by an old Victorian gent out for a spot of fishing – “Sir Edward Carter, explorer to her Majesty Queen Victoria, at your service, my dear!” The old gent is a dab hand at rescuing her and making sure she’s warm, dry, and fed: but otherwise is a bit of a patronising old git when told about the danger of the high priestess: “Humbug!”. Not that this is surprising once we get to the end of the episode and realise that it is his own daughter, Lady Dorotea, who is the very same high priestess! Alice is in more danger than ever before, but she hopes that if she stays close to Sir Edward, his daughter will fear to tip her hand in a way that makes him see the double-game she has been playing. But the high priestess sends some henchmen (henchpriestesses?) in the middle of the night to kidnap Alice and bring her to where the other girls are being kept – now in a dungeon, awaiting Karen’s sacrifice the very next day! The girls plot a desperate plan, under Alice’s lead (even Karen now acknowledges how brave and clever she has been). The sun goddess must go to her death willingly, otherwise the sun god will be angry – so the bribe for that to happen is that if she does, the other girls will be set free, and if not, they will all be killed. So someone must put herself up for sacrifice, and conveniently the costume has a golden mask, so someone else could take Karen’s place while the others go to Sir Edward for help… not that anyone is willing to risk death, apart from Alice of course. By the end of the episode she is bound to a sacrificial altar, hoping fervently that the ceremonial chanting will take long enough to give Sir Edward plenty of time to come and save her – until another earth tremor convinces the high priestess to move the schedule on a bit quicker! The earth tremors only grow further in intensity, and the panicking Incas start to flee for their lives. When Alice manages to free her hand enough to remove her golden mask, the sight of their ‘false goddess’ causes the rest to flee – but not Lady Dorotea of course, who is all too willing to kill the stumbling block in her way. Finally the cavalry arrives, in the form of Sir Edward, who informs his daughter that the earthquake has stopped the spring from flowing, and so they are both doomed in any case. Of course the vengeful harridan would still like to have a final stab (very literally) at Alice, but a convenient chasm opens up beneath the two Victorians and swallows them up, leaving the girl as the sole survivor. She manages to escape the crumbling cavern and rejoins her happy (and, finally, grateful) cousin for a joint river escape with the rest of the schoolgirls. The girls are safe and are returned home, in a blaze of publicity! Of course the uncle and aunt are a fly in the ointment – they are delighted to have their darling daughter back, but know that “it can’t be true'” that Alice was the heroine – it must have been Karen! Alice is understandably worried that she will find herself back in the same situation as she left some four months previously (the newspaper article gives the timeline) – downtrodden by her blood relatives. But no – Karen really has changed her tune, and says “I’m not going to let them bully you into being a mouse again, even if they are my mum and dad!” And all ends happily after all. This is a fantastic story and one of my absolute favourites, though not without flaws (see below). The action moves on swiftly throughout and is full of excellent imagery – the mutton-chop wearing old gent, the deranged high priestess, the beautiful lost city. So much of that is down to artist Terry Aspin, of course, but he had a very strong base to work on and I hope he got a real kick out of it. The elements of the lost city and the spring of eternal youth are far from new, but seen through Alice’s eyes they still work as well as when H Rider Haggard was penning similar tales of “She” and of “King Solomon’s Mines”. 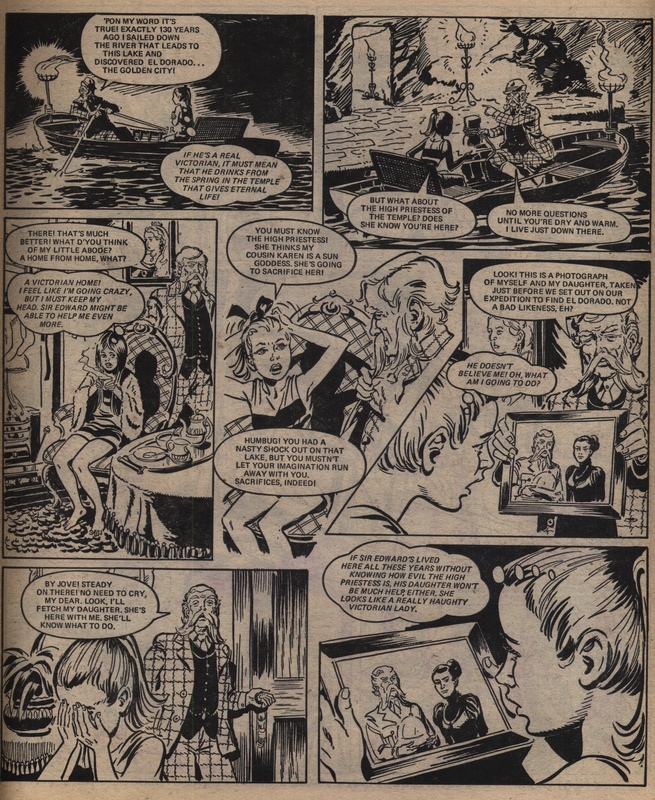 “Alice” was clearly the lead story throughout its run: it was positioned on the first double-page spread of each issue it was in (apart from the first issue, which had the last episode of “Girl Who Never Was“). It also was on the cover 6 times, though always sharing the billing with another story (unlike “Sea Sister”, “The Four Footed Friends“, and “The Forbidden Garden” which all had one or more covers dedicated to their protagonists during this time). This is despite the amazingly strong run of stories at this point – the same issues that this is in also include the stories above and the fantastic “Children of Edenford“, which never was granted cover status). This story was well-thought-of in the editorial office, and deservedly so. It is one of the stories that I never forgot from the time of first reading it, to when I regained copies of Jinty as an adult (and when I first watched Jim Henson’s Labyrinth, I knew the best way for the teen heroine to beat the maze well before she figured it out for herself). I am surprised that I can’t immediately note a translation or reprint version of this story – I am sure I have seen mention of one, so I hope it’s just that I have mislaid the relevant information on any European translation details. 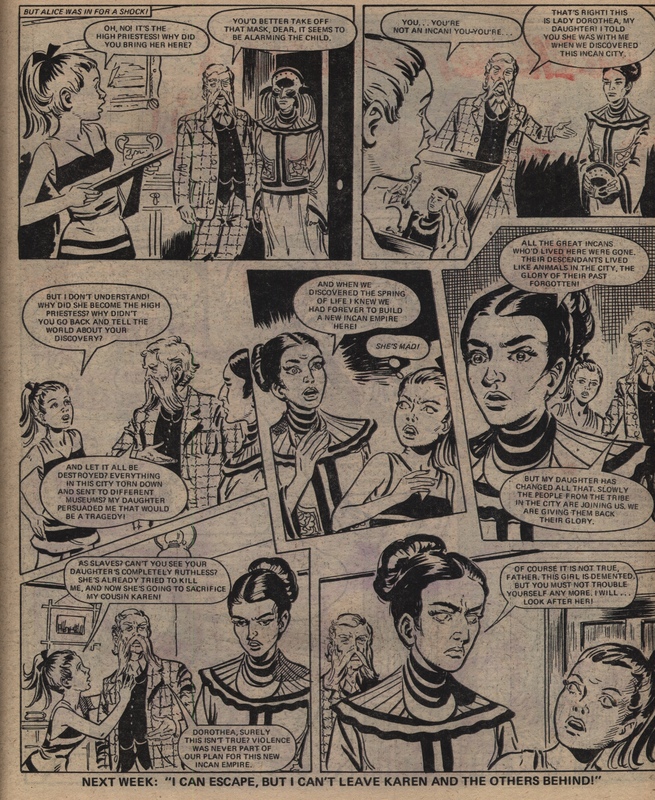 On the downside, once again in Jinty (and indeed in girls’ comics stories generally) the lack of serious research strikes (though I am much more inclined to forgive it in this story than in the lacklustre “The Sceptre of the Toltecs”). To many British people, them-there mysterious lost peoples of the Americas are all very similar – Incans, Mayans, Aztecs are much of a muchness. (The same imprecision extends to naming – the correct term is “Incas” or “Inca”, not “Incans” as the story has it.) The writer of this story got right the focus on gold and on the sun god, which were big elements in Inca society, but seems to have imported much of the rest of the flavour from Mexico (Aztec human sacrifice) or from the Yucatan peninsula that stretches down to Guatemala and Belize (Mayan temples lost in the overgrown jungle). The tame bird that is seen in the second episode is very similar to the beautiful Quetzal bird which is the symbol of Guatemala, but El Dorado is a legend that has its origins in Colombia and hence relates more closely to the Incas. And so on. Of course in some ways it would be wrong for this sort of fantastical story to link itself too closely to a specific real location or people – why not cobble various elements together into one? – but then the fact it refers to the real Inca belies that. Never mind, it’s a great yarn – and as someone who visited some amazing Mayan ruins as a child, the scene setting worked very well for me nevertheless. To the modern reader there are a number of glaring holes. The local people understand English? The tribe have a white saviour complex? The high priestess turns out to be a Victorian explorer’s daughter? The two Victorians and the rest of the temple staff don’t seem to have lost their memories with all the drinking of magic water every night? Yeah right. But the various implausibilities of the stories never detract from the solid and exciting story that rushes you along. It’s a long run – 17 episodes – but it never drags or repeats itself. I hope that it will be chosen as an example for Rebellion to reprint in short order – it would certainly very well repay any new attention to it.